This cute Mountain Goat was on the road side on the way up to the top of Mount Evans Wilderness Area trying to find something to eat. The snow behind the goat is actually the snow has accumulated on Mr. Evans Road all winter long that had to be plowed off the road before the Annual Open for the year on Memorial Day. It was funny to see the beautiful goat looking for grass right in front of 7 ft or more of snow. The goats actually lick the stones for the mineral contents. The picture was taken on Memorial Day weekend, after Mt. Evens Wilderness Area has just opened for the summer season. The sun was shining on top of the icy snow and the goat was in the front of the snow bank in the shadow. This piece is painted on board and mounted on a slate base to remind me of the road the goat was on. I arched the shape of the board to be reminiscent of the clouds and the sky overhead. The edge is rounded and painted. 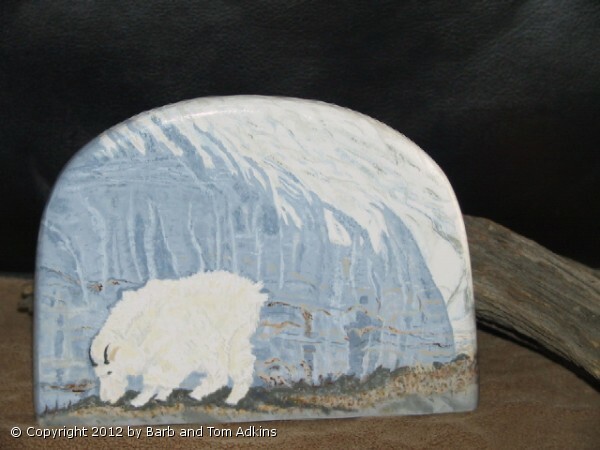 A painting technique called Impasto is used for this Mountain Goat's heavy winter fur coat. About 6 to 7 layers of paint were used to develop the heavy texture of the goat's winter coat. Paint is laid on an area of the surface very thickly, usually thickly enough that the brush or painting-knife strokes are visible. Mt. Evans, in Colorado is over 14,000 ft high. The road to Mt. Evans is the highest paved road in the US. It is only open for travel from Memorial Day to Labor Day because there is too much snow to keep it plowed in the winter. On many days the clouds are below the Summit of Mt. Evans. Mountains over 14,000 ft in Colorado are called 14ers. There are over 50 14ers in CO.
We are lucky enough to live only about an hours drive to the Summit.